The Britannia has always offered beauty and reliability. Now it also gives you 0.9999 fine gold purity.The legendary figure of Britannia, which first appeared on Roman coins in the second century AD has come to symbolise Britain’s strength and integrity Capital Gains Tax exempt. 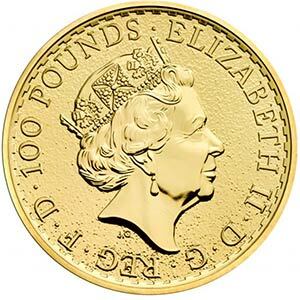 The 1 oz Gold Britannia is one of the most iconic gold bullion coins in the world today. First minted in 1987, it quickly became a rival to the omnipresent South African Krugerrand, as well as the Chinese Panda and Canadian Maple leaf, which were introduced a few years before. 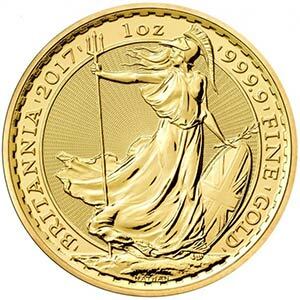 The 1 oz Britannia has a purity of 24 carats, which amounts to 99.9999% fine gold, among the very purest of gold coins on the global market. Before major changes to the coin in 2013, the purity was 22 carats (91.7%). Otherwise, the coin has remained much the same as when it was introduced in the late 1980’s. With Queen Elizabeth II on the obverse, the inverse depicts the figure of the Britannia (designed by Philip Nathan in 1987). The Britannia first appeared on British coins in the Roman era, around the 2nd century, and has been something of mainstay ever since. The pre-2013 1 oz Britannia was larger than the newer version, and appeared slightly orange due to its copper content. The post 2013 Britannia coin weighs 31.104g and has a diameter of 32.69mm. It has a thickness of 3mm and a milled edge. It’s face value is £100, but the coin’s actual value is much higher, with it’s fine gold content worth many times this figure. The coin has also been made available in silver since 1997 and is often bought alongside it’s gold equivalent as part of a set. The 1 oz Gold Britannia is capital gains exempt and all our coins are verified by the relevant authorities. Goldinvestments.co.uk is one of the most experienced gold vendors in the country, and, unlike most online traders, we have a physical office in London from which we are happy to provide advice through our renowned customer service department.